The Norse, like all Aryan or Indo-European people, were by origin an aristocratic-warrior people whose social structure was ordered hierarchically with an inegalitarian orientation. The Vikings loved competition. This love of competition and natural desire for prestige formed the basis of their racio-spiritual being, and in turn formed the basis of their mighty civilization. This love for competition is evidenced by the Vikings’ martial prowess and the central role combat, both heroic and militaristic, played in the formulation of the Norse ethnos. The Viking desire to engage in combat, to struggle against an opponent, wasn’t confined solely to the battlefield. In his Metaphysics of War Julius Evola posits that in combat, war isn’t necessarily about overcoming an external opponent, but more about the act of “overcoming” in a very broad and generalized sense. The greatest enemies that we face, like our Norse brethren, are our human weaknesses: our fears, our passions, and our baser instincts. To “conquer” these vices through the act of self-overcoming is often more rewarding than engaging in martial combat. In the language of Nietzsche, man is something to be “overcome,” and by channeling our base animal instincts into a vessel for personal transformation, the Viking warrior, just like the postmodern White Nationalist, may become something greater. An old Nordic saying posited that Viking leaders were like bridges, and we postmodern White Nationalists must become “bridges” for our own unenlightened racial kindred, guiding them towards the light of our potential. The Vikings fought one another with ferocity, in a struggle for prestige, glory, and divine favor, but never in a manner detrimental to the totality of their civilization. The Vikings fought one another so ferociously because to do any less would be an insult and an offense to the Gods. Combat was fierce between Vikings but moderated, and exercised in a manner that showcased their intrinsic physical and spiritual strength. The actions of Nietzsche’s “blonde beast,” like the martial actions of the Vikings emanated not from malice, but from the cultivation of this strength. A defining trait of the Vikings, and of White/European civilization as a whole, is our races’ unique propensity for intraracial, low-intensity conflict. Vikings warred with other Vikings and with other closely related European peoples, but even in times of looting they did so in a fashion that relied upon discipline, control and restraint. In Nietzschean parlance, the Übermensch (‘Overman’ or ‘Superman’) is an individual who has “organized the chaos of his passions” and has done so in their quest for “joy [through positive] self-conquest.”  The Vikings mastered their passions, unleashing their rage when appropriate, and sheathing it when not. The nature of the White Nationalist movement, specifically its small number of adherents, in conjunction with the fringe position it occupies in Western society is mirrored by the historical experiences of ‘Viking-Age Scandinavia.’ During the Viking Age (8th–11th century AD), Norse Scandinavia, and the entirety of Northern Europe, was extremely underpopulated, particularly when compared to the other regions of Europe which had come under Roman control. 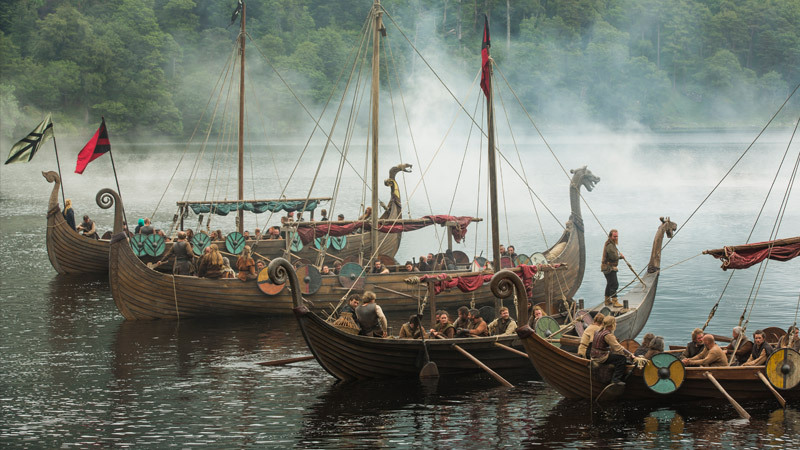 Some establishment historians have erroneously posited that Viking raiders, explorers and farmers left their homes and ventured into the “wine-dark” northern seas, solely for environmental reasons, related almost entirely to overpopulation. This assertion is childishly simplistic and mired in the unsound historical premises of historic environmental determinism. Race is a prime mover and shaker, and culture is a direct result of racial temperament; to posit contrary notions is disingenuous at best, and is clearly ideologically-driven rather than a reflection of sound historical judgment. Similarly, like our Viking kindred, we in the White Nationalist movement find ourselves outnumbered and misunderstood. If the court historians and “social scientists” of the postmodern age can’t even form an accurate understanding of our history, either because of idiocy or ideology, than the words of Nietzsche reign even truer: “life is the struggle of the many against the few, the commonplace against the rare, the weak against the strong.”  Our struggle is within ourselves as individuals seeking self-improvement, within our ‘dangerously’ fractured movement, and with the establishment we seek to change through our metapolitical struggle. If we wish to give battle to the reigning ideologies of the postmodern West, we must first steel ourselves, and then channel our power outward. The White/European predisposition for heterodox thinking is rooted in our people’s unique ethno- and evolutionary history. The great prophet of decline Oswald Spengler speculated that the Nordic (Aryan/Indo-European/European) soul was forged in the “harder struggling” environs of the “Nordic steppe,” and though I am not an environmental determinist, I would hold that this is partially true. In the early Indo-European world, and even later in the Norse world of the Viking Age, the love of competition, permeated by the struggle of low-intensity conflict and in conjunction with the extreme climes of Northern Europe, gave birth to an inegalitarian and hierarchical society of aristocratic-warriors and heroic individuals. These individuals favored deed and action over the pettiness of mere physical existence and material comfort. The cumulative tempering effect of all of these forces gave shape to the White/European man, whose desire to transcend the biological and the material, whose penchant for a grounded abstract, became a proclivity for transcendence through self-overcoming. The White race’s ability to think clearly and creatively, harnessing our inner ‘Faustian’ nature has always been our people’s greatest strength, and we would be wise to continue to harness that which has always made us strong. As White Nationalists, we’ve dedicated ourselves to representing the highest, most transcendent attributes of our race, and the utilization of our ‘Faustian’ spirit in the service of a cause greater than our individual egos should be one of our greatest ideals. Ernst Jünger proclaimed that the underlying principle of the modern world is the centrality of pain. By experiencing and embracing hardship we have much in common with our Viking and Indo-European ancestors, and as such possess the potential for yet-undreamed-of greatness. Adolf Hitler once said that the Aryan “is the Prometheus of mankind” and I can conjure up no better epithet to describe the collective awesomeness intrinsic to our blood.